Madagascar is a world apart. It is a land of lemurs, chameleons, and mystery. The island has been separated from mainland Africa since the end of the Jurassic era, 150 million years ago. This was before the origin of passerine birds, so all the songbirds on Madagascar evolved from colonists that reached Madagascar, presumably in large part from Africa. The avifauna is depauperate and 80% of the passerines are endemics. Until very recently it was thought that many of these passerines arose from multiple colonizations of the island, and various birds were assigned to widespread Old World families such as bulbuls, babblers, and Old World warblers. But brand-new molecular evidence contradicts this 'conventional wisdom.' Most of the endemic passerines of Madagascar evolved from two ancient radiations: the vangas (Yamagishi et al. 2001) and a radiation of Malagasy warblers (Cibois et al. 2001). This 'Malagasy clade' is at least 9 million years old; its closest relatives may be African warblers such as cisticolas (Cibois et al. 2001, Barker et al. 2004). Much remains to be resolved about the relationships of this group, but it is now clear it is a distinctive group. My headline species (left or above) now bears the title Cryptic Warbler, with a jaw numbing scientific name: Cryptosylvicola randrianasoloi. When I took this photo in November 1992, the bird had no name at all. It had just been discovered to science a couple weeks before by Bret Whitney and Jan Pierson while scouting for the Madagascar tour on which I became a participant. I thoroughly enjoyed documenting this "new" bird while they tape-recorded it, and joined in the speculation on its affinities. I gave it the temporary name "Ridgeline Warbler" — for its primary habitat (see photo at top of this page) — but the formal description went with another moniker (Goodman et al. 1996). Obviously, Cryptic Warbler has been mislabeled as a sylvid [Old World Warbler] for just a couple of years, but Cibois et al. (2001) found that this group included species that had previously been assigned to three different families. Their study identified nine species in the Malagasy warblers but they suspected there were others whose genes had not yet been sequenced. Dickinson (2003) has 11 species grouped together within "Incertae Sedis" (=a unlabeled holding spot pending further study), including two that Cibois et al. (2001) thought were part of the clade. At present it looks like the Malagasy warblers contain four former sylvids, two former babblers, and five former bulbuls. 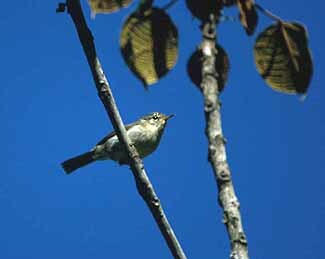 A mislabeled "sylvid" was the Thamnoris (right; sometimes called 'Kiritika Warbler'), here shown singing vigorously from the tip of one of the strange, exotic plants in the spiny forest of southwestern Madagascar. The other former sylvids are Wedge-tailed Jery, separated from the rest of the jerys (which are African warblers related to cisticolas) and placed it in a different genus Hartertula flavovirdis, and Rand's Warbler Randia pseudozosterops [Cibois et al. 2001 did not have genetic material from this taxa, but thought it could be a related species]. The two "babblers" that are part of the group are the White-throated Oxylabes Oxylabes madagascariensis and Madagascan Yellowbrow Crossleyia xanthophrys (often called 'Yellow-browed Oxylabes'). In contrast to the former sylvids that perch out in the open and are relatively easy to observe, these two are ground-hugging skulkers. During my 1992 visit, we heard both of them several times and worked with tapes for views, but only Rita saw both; I could never get my bins on the Yellowbrow. Cibois et al. (2001) also studied the third claimed "babbler" in Madagascar — Crossley's Babbler Mystacornis crossleyi — and it was neither a babbler nor a part of this newly-discovered radiation. It is, instead, in the great corvoid radiation and is likely a vanga! Appert's, Dusky, and Grey-crowned Tetrakas are scarce and declining. Appert's Tetraka, for example, is limited to patches of remnant forest near the southern tip of Madagascar. We readily found it in the Zombitsy Forest in 1992, but during our visit the edges of that forest were been chopped and burned for charcoal. Charcoal is a primary fuel throughout Madagascar and many forests are shrinking as they are converted to charcoal. A few birds in the Malagasy warbler groups are found in the dry southwest (including Thamnoris and Appert's Tetraka) but most occur in the humid rainforests along the eastern escarpments. Up to 7 species of Malagasy warblers may co-occur at the same site; up to 5-6 can be in the same mixed species flock. All members of this groups are "largely insctivorous, but they do segregate to some extent by diet as well as by foraging stratum" (Schulenberg 2003). Cibois et al. (2001) point out that the large corvoid radiation in Australasia had been hidden by convergence for centuries and was only discovered through the biochemical DNA-DNA studies of Sibley & Ahlquist (1990) and progeny. It is exciting to learn that a similar radiation of passerines occurred in Madagascar twice: first, a radiation of vangas (17 species per Cibois et al. 2001) and then this radiation of Malagasy warblers (at least 11 species). Madagascar also has had radiations in non-passerines with the now extant ground-rollers (5 species), Cuckoo-Roller (1 species), mesites (3 species), and couas (9 species). Thus Madagascar has had several incursions of birds from (presumably) Africa that became isolated and then evolved to fit various open niches. In contrast, the Galapagos finches arose from just one radiation (13 species) and the Hawaiian honeycreepers also arose from a single incursion (33 species historically). Cibois et al. (2001) recommend that the Malagasy warblers be considered a part of the Old World Warblers [Sylvidae] for the present, awaiting "improved resolution of relationships both within the endemic Malagasy clade and between the Malagasy clade and other sylvioid songbirds." This is, indeed, the current approach by Dickinson (2003) and Handbook of the Birds of the World. In due course and as further studies refine these and the finding of other researchers, there will be major revisions in the classification of sylvid warblers, babblers, and bulbuls. Although setting up this family now is a bit premature (and the name Bernieridae may not prove to be the chosen name), recognizing this Malagasy radiation as a family seems only a matter of time. World birders should be aware of its existence now. Photos: The Cryptic Warbler Cryptosylvicola randrianasoloi was responding to tape playback along a ridgeline above Perinet, Madagascar, on 18 Nov 1992; the photo of the habitat (top of page) was also taken at that time. The Thamnornis Thamnornis chloropetoides was near Ishfay, s. Madagascar, on 21 Nov 1992. All photos © 2004 Don Roberson; all rights reserved. There is no "family book" covering the Malagasy warblers, but good photographs and information about them are in Morris & Hawkins (1998). Goodman, S.M., O. Langrand, and B.M. Whitney. 1996. A new genus and species of passerine from the eastern rain forest of Madagascar. Ibis 138: 153-159. UNCH Press. Yamagishi, S., M. Honda, K. Eguchi, and R. Thorstrom. 2001. 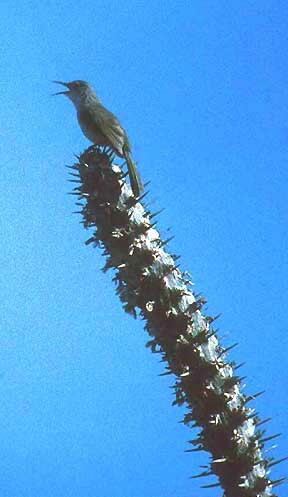 Extreme endemic radiation of the Malagasy Vangas (Aves: Passeriformes). Journal Molecular Evolution 53: 39-46.